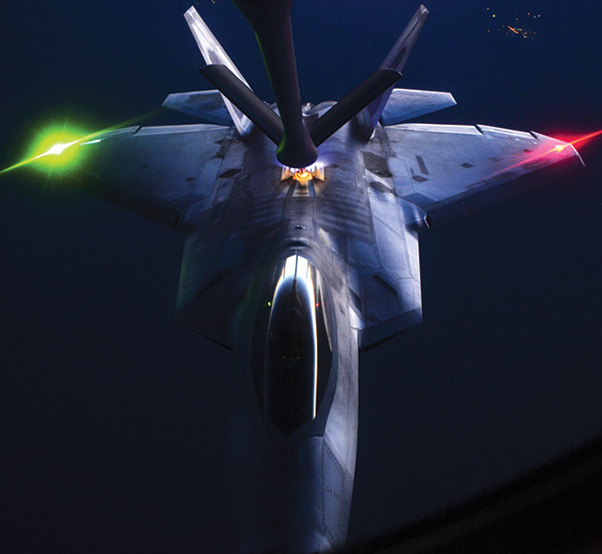 A KC-135, assigned to the 509th Weapons Squadron, Fairchild Air Force Base, Wash., performs aerial refueling on an F-22 Raptor, assigned to the 433rd Weapons Squadron, Nellis Air Force Base, Nev., over the Nevada Test and Training Range during the United States Air Force Weapons School’s Deliberate Strike Night, June 16. DSN is part of the final seven day Advanced Integration portion of the Weapons School curriculum; testing stealth and conventional airframes abilities to conduct attacks during the hours after the sun sets. NELLIS AIR FORCE BASE, Nev. — The United States Air Force is well known as the pinnacle of air superiority. Guaranteeing this supremacy is the Airmen who wear the coveted patch of the U.S. Air Force Weapons School. With approximately 100 weapons officers and enlisted specialists graduating from the school every six months, these Airmen are truly top-notch in their fields. At the conclusion of nearly 400 hours of graduate-level academics and combat training missions, the Weapons School curriculum culminates with a week-long series of exercises known as Advanced Integration. Composed of six different missions, Advanced Integration contains one of the most dynamic pertaining to fourth and fifth generation airframes. This is known as Deliberate Strike Night. 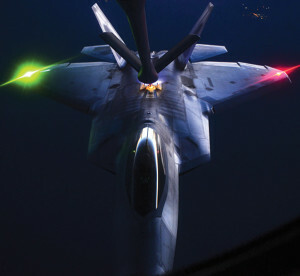 DSN reflects the degree of cutting-edge training provided by the Advanced Integration portion of the Weapons School curriculum by testing stealth and conventional airframes’ abilities to conduct attacks during the hours after sunset. Since the purpose of DSN is to show the full-spectrum capabilities of the approximate 60 Air Force and U.S. Navy assets participating in the exercise; planning such an intricate exercise is no simple task. While Roe oversees the planning of DSN, its implementation requires cooperation of a multitude of specialized offices for the event to unfold smoothly and successfully. In the design of DSN, one vital factor to take into account is the exercise’s stealth execution during hours of darkness. Since the focus of DSN is on fifth generation stealth assets with fourth generation conventional assets, one of the main night players is the B-2 Spirit. With the B-2 at the forefront of the exercise, the stealth bomber pilots also serve a critical role in the execution of DSN. While the B-2 and its pilots play a central role in the execution of DSN, the night wouldn’t be possible without the integration of the nearly 60 other airframes participating. These airframes working together serve to accomplish DSN focus of Air Force low-observable and conventional platforms deliberately targeting an adversary’s simulated integrated air defense system in an Anti-Access, Area Denial scenario. This focus makes DSN a distinctive part of Advanced Integration and the unique training of the select Airmen who earn the coveted Weapons School patch and who ensure the air superiority of the United States Air Force.